With Global Poker's latest installment in their ongoing Global Poker Championships, 'The Rattlesnake Open' due to kick-off on Monday, the US's fastest growing poker site are giving all their players the chance to 'get their fangs' into a pre-championship $5,000 freeroll this Sunday at 2.00pm ET. The freeroll is unrestricted, meaning that there are no prior qualifications or conditions which need to be fulfilled in order to participate. Basically, if you have an account at Global Poker, you're invited to take part! And if you don't have an account then as long as you remedy that and sign up by Sunday then you too can join the action. Although the official start date of the $1.25m Rattlesnake Open is Monday 30th April, points earned in the $5,000 freeroll will still count towards the $15,000 Global Poker Championship Leaderboard, where the winner will earn the right to represent Global Poker in a live poker tournament. 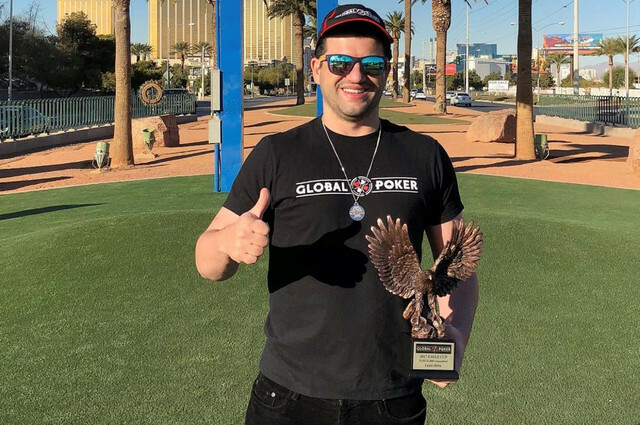 Also, the $5,000 freeroll is very much considered a championship event, and as such the winner will receive the first Global Poker Champions Pack of the season which, as ever, will include plenty of Global Poker swag and the first ever awesome Rattlesnake Trophy delivered to their doorstep. What's more, the lucky winner will then immediately be eligible for the Hometown Heroes promotion, where they can earn up to SC$1,000 just by sharing photos or videos of themselves wearing their newly acquired Global Poker clothing with the sites social media channels. Check out full details of the Hometown Heroes promotion here. Above: A previous Global Poker Champion earns some extra $weeps Cash for participating in the "Hometown Heroes" promotion in the first leg of the Championships, the "Eagle Cup". When the freeroll is out of the way the serious business of the Rattlesnake Open's 135 championship events covering a multituide of formats and game-types will begin, and with $1.25Million in guaranteed cash prizes to be won there is more reason than ever to get involved at Global Poker. What better way to kick-off three weeks of non-stop championship action at the $1,250,000 Rattlesnake Open than the chance to earn your buy-ins to your favourite events for free? If you haven't already done so then make sure you sign up to Global Poker, the only US facing poker site offering legal cash prizes throughout North America.